With SEQ-S, unlike many digital EQs, the SEQ-S features a phase profile that is linear across the frequency spectrum, which results in natural-sounding EQ changes and produces minimal phase artifacts. SEQ-S also includes a unique resolution setting that can be used with high precision in the low frequencies, allowing for highly transparent adjustments without muddying the mix. 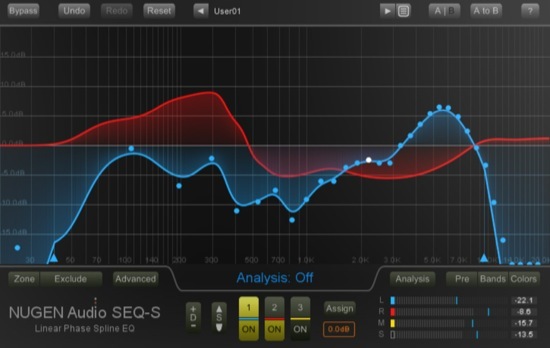 Through SEQ-S’s direct-draw interface and spectrum analysis, users can identify and fine-tune their audio. When coupled with EQ matching via sonic fingerprinting the plug-in can offer the option to match one recording to another to capture the “flavour” of a piece of source audio and then transfer it to the current project. In addition, SEQ-S’s EQ invert button provides a subtle technique for creating space in a complex mix, a task that can be too cumbersome with a traditional EQ. In a typical music project, by “sampling” the vocal and then using the EQ invert button to apply the inverted curve to the backing, users can gently create specific space without unnecessarily damaging the original tonality of the underlying audio. We will be making a Show & Tell video review of the SEQ-s very soon. SEQ-S is available now and there is more information about SEQ-S on the Nugen Audio website.